Do you know how to use FaceTime, Skype, or Facebook? Can you text and email with your iPad or Android? Most high school seniors can pick up any device and quickly navigate through any new app. Their form of communicating is much different than their parents or grandparent’s generation. Jackson Barlow, a homeschooled high school senior, saw a need to help his granddad’s friends at Springmoor. 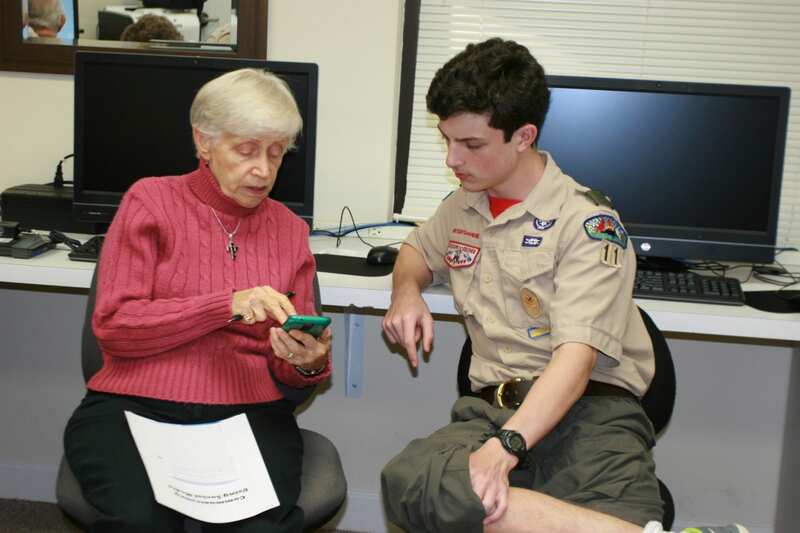 Jackson, the grandson of residents Jim and Faye Bundy, began thinking about this idea for his Eagle Scout Project. He has assisted the Residents Association’s Computer Committee in teaching the Computer Lab’s Introduction to Computers class on several occasions. 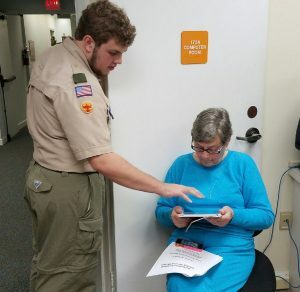 By helping in the Computer Lab, he realized the residents wanted to learn how to use their own devices to communicate with their family and friends. His Eagle Scout service project was born out of his desire to help seniors become more familiar with the basics of how to use their smart phones and computers. 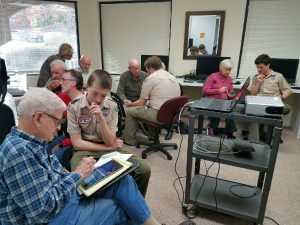 His first step in this big project was to find out what devices and applications the residents wanted to learn how to use. He sent a short survey to everyone asking detailed questions so that he could design a class that worked for everyone. He was pleased to see that over 40 responses were returned. 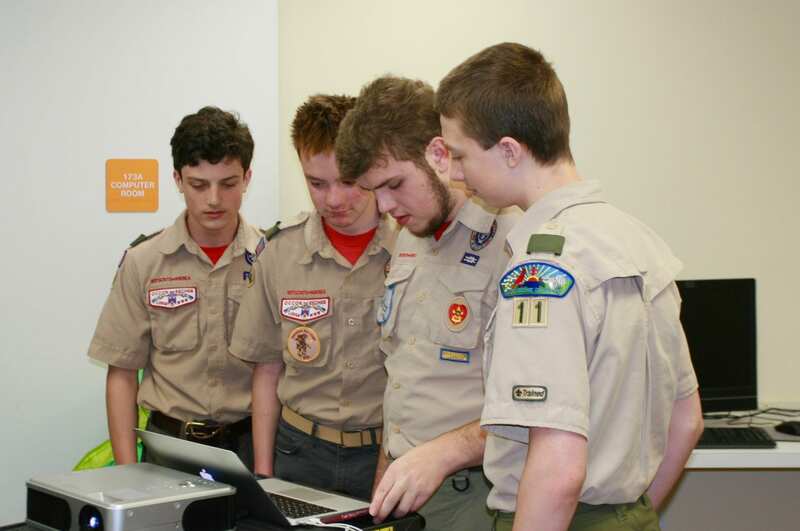 Part of the Eagle Scout service project involved Jackson leading a group of assistants. He formed a great team of other homeschooled scouts, David Bass, Justin Newton, and his own brother, Parker. Jeff and Karen Barlow (Jackson’s parents) also assisted with the project. Through these detailed surveys, Jackson got a good feel for exactly what the residents really wanted to get out of the class. He divided the classes into two different groups. One class was for Apple devices and the second class was for Android or Windows devices. There were some who wanted to learn to text and send photographs. 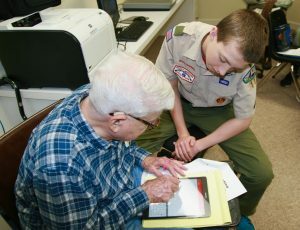 Some that needed to know how to send an email and others that wanted to learn how to FaceTime with their grandchildren. A few asked for help setting up new devices. 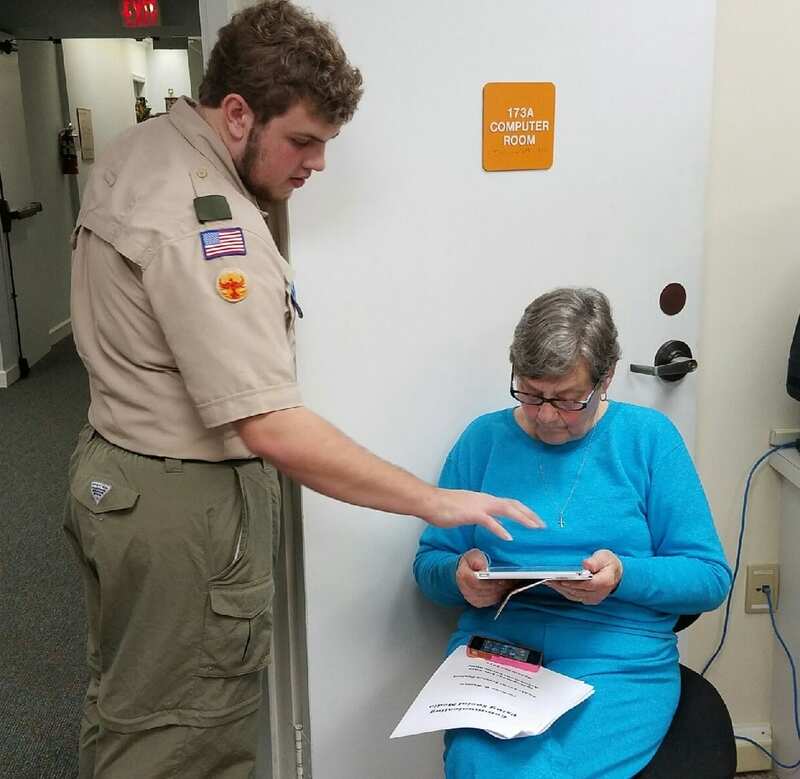 Jackson’s team provided one-on-one assistance to everyone in the class. It proved to be an exciting day not only for Springmoor residents but the scouts too. As Jim described the day, “seeing the light bulbs go off” as the student finally understood what their teacher was saying was magical. He said he is not sure who learned more – the resident or the scout. What comes so naturally to teenagers most definitely takes patience, persistence and lots of trial and error from both sets of seniors. Watching the boys navigate with their fingers sliding across the keyboard or the screen seems like such an easy maneuver. For those who learned to type on manual typewriter an Android with a flat screen can be quite intimidating! Jackson began scouts when he was seven years old. Now, almost 18, he is in the final stretch of obtaining his Eagle Scout rank, the highest rank awarded in Boy Scouting. Jackson is not only is a computer whiz, this past summer he earned his Private Pilot’s license! One of the proudest days for Jim and Faye was the day their grandson flew them around in a plane in which he was the Pilot in Command. He will graduate from high school in May and is considering attending Guilford Technical College to earn his Associates Degree in Aviation. Jackson’s class was a success for everyone! He returns next week to follow-up with each resident. Of course, he sent his two classes home with homework. They were asked to try out what they had learned and bring back more questions. The follow-up class will test how well they are doing and what they want to learn next. 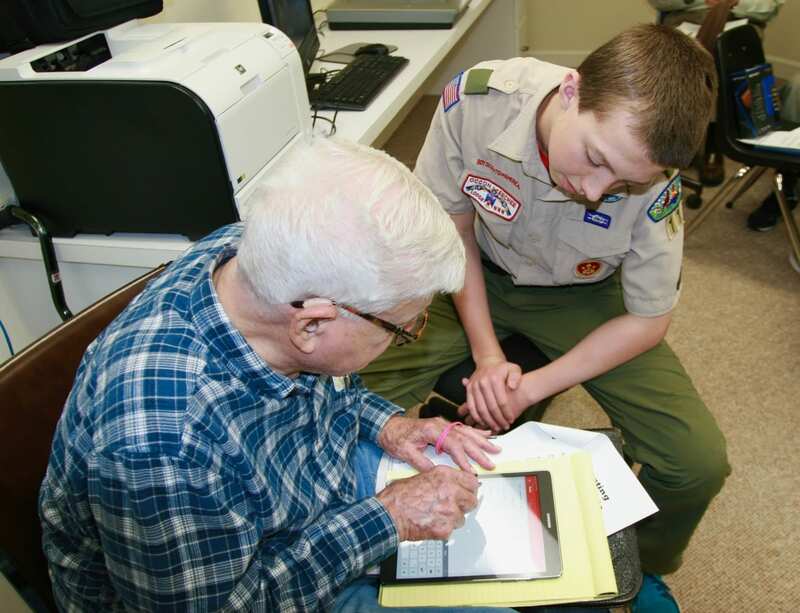 This scout is quickly on his way to an Eagle rank. His presentation, his patience and his creativity proved to more than a lesson in senior communications.